Preachology is a ministry started by me, J. Mark Hollingsworth, for the purpose of educating and encouraging young preachers, empowering and enriching busy preachers, as well as refreshing and refueling discouraged preachers in their preaching ministry. I would like to be your partner in the preaching ministry if you will let me. By that, I mean I want you to be my partner as well. I need encouragement; you need encouragement; we all need encouragement. My hope is that this web site will become a place where we can all get the help and encouragement we need to continue the preaching ministry that God has called us to. I started Preachology not long ago as a result of a long ago search. The fact is, I've had a web site for my ministry since 1996. I had to learn some "html" code and figure out how to get it on the web for myself. It wasn't too professional. Later that web host changed their system and I couldn't even update my own web site. Needless to say, I was dissatisfied and had very little traffic to my web site. Off and on for years I have searched for another web host who would help me successfully build and promote my ministry. But I didn't know who to trust. There are hundreds out there who want to host your web site and some of them will do it very cheaply. But what good is a cheap investment with a cheap return? Finally, I ran across another ministry web site who used and recommended Solo Build It for web hosting. When I investigated Solo Build It's web site, I got excited about the possibilities of a new web site for my ministry as well as the ministry it could be to and for other preachers. Besides the education Solo Build It provides for starting and building your web site, they also help you get the traffic you need for your ministry (or business) to actually be seen by those who need to see it. My Solo Build It web site is already on target to get as many visitors in the first year of it's existence as my other web site has had since it started in 1996...12 plus years ago. Update! My website is now on target to get as many visitors in a single month as my old website did in twelve years! If your web site or blog ministry has little traffic, which equals little ministry influence and/or ministry income, please investigate Solo Build It like I did. You will be glad that you did. Just click on the video below for a brief word about Solo Build It. When that brief video clip is finished click the link below the video to see just how powerful SBI websites really are. There are some amazing statistics and other videos there that explain exactly how the Solo Build It system works. Listen and get excited about the possibility of a web ministry that actually gets results! Click here to see the amazing results of SBI websites. 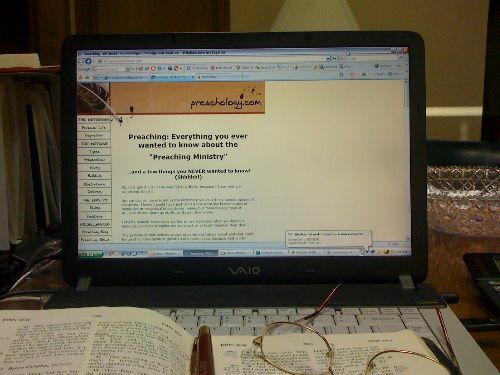 Return from "Preachology and Me" to Home Page.